The Museum Volkenkunde has engaged in 100 MIGRATORY and vessel no. 70/100M in a way I have never expected. They have a blog with images and text in Dutch. Please have a look at http://volkenkunde.nl/nl/node/506. Vessel no. 70/100M continues its journey in the Netherlands. All photos: Hannie Schut. AAMU = Museum of Contemporary Aboriginal Art in Utrecht. Yesterday we were at Astrid’s house. From 1998 on she has been for many years our teacher of the Swedish language. Because of her warm patience we both learned to speak and read Swedish. And by that she created for us the possibility to meet many people in the North in their first or second language. So we did….. I recieved some wonderful images tonight I want to share with you all. Hannie and Margot, Cunera Buijs, Volkenkundig Museum in Leiden and everyone else involved in vessel no. 70/100M journey around in the Netherlands; thank you! Own blog for vessel no. 70 at Museum Volkenkunde Netherlands! Blogg in dutch from Museum Volkenkunde in Leiden Netherlands, the place where vessel no. 70 is located right now!! 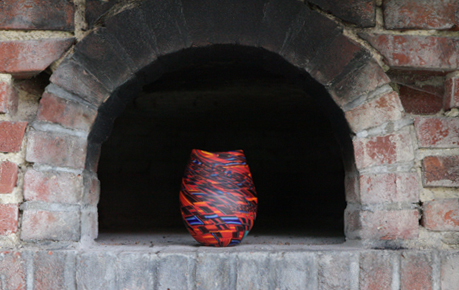 Vessel no. 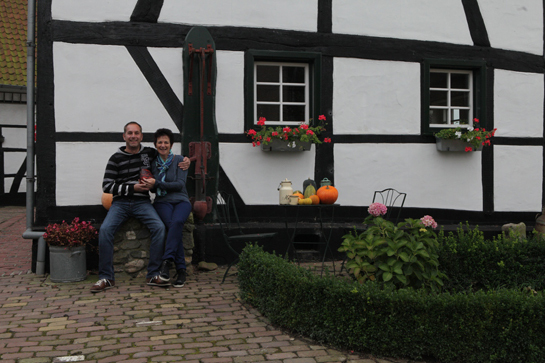 70 in the hands of Petra and Jan in the province of Limburg Netherlands. Oh, I just wish we had that fresh beautiful selection of pumkins here in Tärnaby… I long for pumkinsoup with coconutcream and brown sugar! 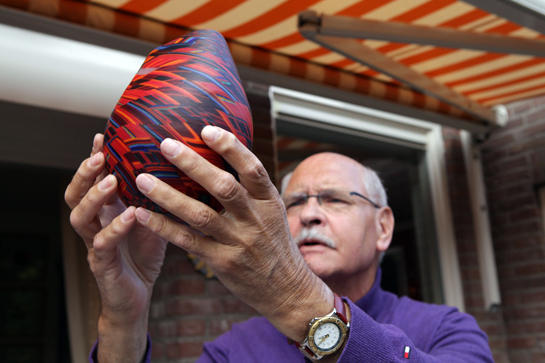 Vessel number 70 just started its tour in the Netherlands, thanks to Hannie and Margot! Here in the hands of Hans and Els Sondaal, Utrecht. However, I am happy the embassy in Russia will take care of a vessel, even if the Swedish embassy in Moscow is a closed area for the public. So 24 Swedish embassies are going to receive a vessel of glass part of 100 MIGRATORY within the next few months – as a loan for up to half a year. Photos from the different countries and embassies will later be part of the final exhibition January – May 2014 at the museum of Västerbotten in Umeå Sweden. Several private persons will also be part of the art project, as a “caretaker” of a vessel each. Today I have no. 70 in the Netherlands, no.17 in Norway, no. 41 in Switzerland, no.14 in Spain, no. 56 leaving for Iceland and no. 88 for China. And I’m home in Tärnaby with vessel no.40.